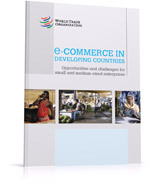 “E-commerce in Developing Countries” focuses on the relationship between electronic commerce (e-commerce), development and small and medium-sized enterprises (SMEs) and on how some SMEs have used e-commerce to promote, market, service and sell their products nationally and internationally. E-commerce and mobile telephony have transformed the lives of many people in developing countries. This brochure investigates both the opportunities and the challenges facing developing countries and assesses how issues concerning adequate levels of telecoms infrastructure, regulation and investment either help or hinder SMEs from finding new opportunities through e-commerce. Case studies help to illustrate that much of the support to e-commerce depends on having or providing the right infrastructure, regulations and the policy mix allowing e-commerce to thrive.